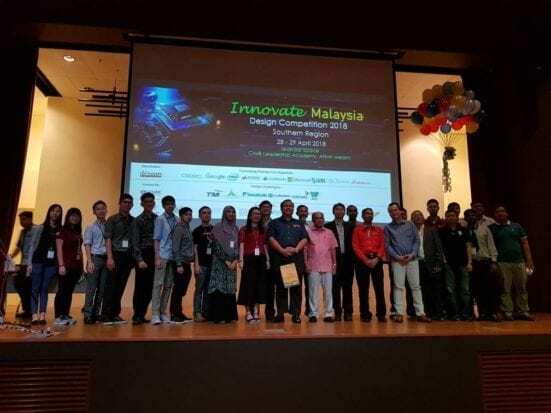 Universiti Teknologi Malaysia (UTM) emerged as the big winner in Innovate Malaysia Design Competition 2018 (Southern Region). UTM was awarded with a total of six prize awards which included five first prize awards and one Excellent Award (Overall Champion) in this competition. All the winners in this Southern Region will advance to the Grand Finale of Innovate Malaysia Design Competition 2018. The team from Faculty of Electrical Engineering (FKE) has won the first prize in Microsoft Track and the Regional Excellent Award in Innovate Malaysia Design Competition 2018 (Southern Region). The project title is Machine Learning on Fetal Distress during Pregnancy. The product of the project is “bbCare”, a portable IoT device which can help a pregnant mother to monitor her fetus condition during the pregnancy. Fetal electrocardiogram (ECG) and electrohysterography (EHG) are collected and sent to a smartphone for signal processing and transform into cardiotocography (CTG), then the extracted features of the CTG are sent to Azure Cloud for Machine Learning and online data storage. Another team from UTM FKE won in MathWorks Track. The project title is Automated Prescription Lens Calculator for Myopia using Machine Vision and Proximity Sensor. This system can help people to diagnose and identify their myopia (nearsightedness) by themselves with the MATLAB Engine. The project was developed by Liew Tian Chin and Albert Sia Kah Dak who is supervised by Dr Amirjan bin Nawabjan. Winner of Google Track was also a team from FKE with the project title of Intelligent CCTV for Workplace Safety and Security using TensorFlow Deep Learning Application. The team members are Lim Ji Chen, Chin Linn Kern and Matthias Tiong Foh Thye from FKE. The team is supervised by Prof. Dr Ramesh K S @ Mohd Zaidi Bin Abd Rozan, and Dr Mohd Shahrizal Bin Rusli. For the SOLIDWORKS Track, a team from Faculty of Mechanical Engineering (FKM) has won with their project titled The River Rubbish Collector. The team members are Asyraf Sharif Bin Badar Sharif, Adam Maxwell Doumin, and Farah Atiqah Binti Ibrahim. The project is supervised by Dr Muhamad Noor Harun and Dr Muhammad Noor Afiq Witri Muhammad Yazid. Last but not least, a team from Faculty of Biosciences & Medical Engineering (FBME) has won the TM Design Challenge. Their project title is UP2 Board Intermediary Device for ECG Patch Continuous Monitoring of Paediatric Patient with Congenital Heart Disease. The team members are Muhamad Khairi B Kamarudin and Amir Mustakim B Ab Rashid. The team is supervised by Dr Muhammad Haikal Satria. Congratulations to all the winning teams and good luck in the Innovate Malaysia Design Competition 2018 Grand Finale.